Learn to weave a coiled basket. This kit teaches one-rod, two-rod and three-rod coiled basketry. Beautiful color step-by-step photos of the basketry process. 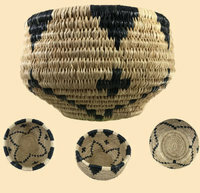 Wedding Baskets are made by Native Americans in the Southwest and are used in a variety of ceremonies. Prepare to spend some time on this project, it could take more than 8 hours over several days. Made in the USA, kit includes;fiber rush, raffia, tapestry needles and a 16-page full color instructional booklet. Booklet includes detailed information and history on the Wedding Basket. 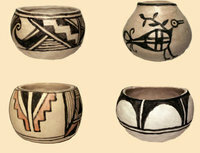 This kit teaches the history, traditional pottery methods and many designs from New Mexico and Arizona. Many beautiful and authentic designs included in booklet. Learn how to form a pinch pot or a few smaller pots. The clay is self-hardening but not waterproof. Made in the USA, kit includes;clay, dry paint powders, yucca leaves, stone for polishing the pot, and a 12-page full color instructional booklet. Ages 8+, may require adult assistance. Learn to weave! 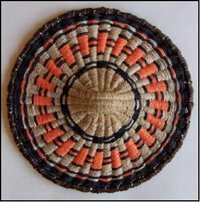 This kit teaches detailed information and history on the Native American weaving process, including weaving origins and mythology, history, traditional techniques for dyeing fibers, the weaving loom and carding and spinning.The kit teaches the basics of the tapestry weave. You will construct a cardboard loom and weave wool yarns into an attractive weaving. Made in the USA, kit includes; wool yarns, cotton warp thread, weaving board, tapestry needle, comb and a 16-page full color instructional booklet. Ages 10+, may require adult assistance. 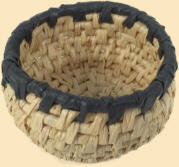 Learn to make a wicker basket! 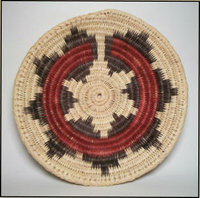 This kit teaches how to weave a wickerwork wall plaque in the style of the Hopi in Arizona. The pattern in this kit is the ceremonial Spider Woman design. Many Native American people believe that their ancestral spirit Spider Woman taught the people how to weave, and that she weaves the rain clouds that nourish the people's crops. Spider Woman is very important to both to many cultures in the Southwest. Prepare to spend some time on this project, it could take more than 8 hours over the course of multiple days. Made in the USA, kit includes; fiber rush, hemp twine, paper raffia, a tapestry needle and a 16-page full color instructional booklet.